Our Busch Stadium adventure began at 6:15am Friday morning. We woke up, scrambled into jeans and t-shirts, found coffee, and walked the 12 blocks down to the stadium. There, sitting next to a bus shelter, were two fans in Cardinals hats, sitting in folding chairs and reading hunting magazines. They were waiting for First Pitch tickets, which was also the reason we were up at that ungodly hour on the second day of our vacation. We were joined shortly thereafter by a few dozen other folks, all in Cardinals regalia, even at the crack of dawn. I am not sure that Mets fans would be showing up at 7am making sure they were properly attired. First Pitch tickets are a wonderful thing. 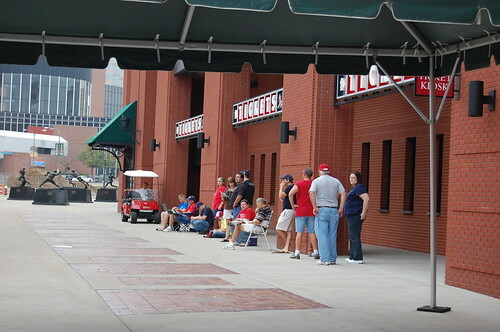 The Cardinals make 275 pairs of tickets available for EVERY GAME. At 9am you walk up to the ticket window and hand over $11 for a voucher. That’s $11 for two tickets, not $11 each. You don’t get your tickets until 10 minutes before the game starts, and the envelope is handed to you on the other side of the turnstiles, so there’s zero opportunity to scalp them. And you don’t know until you open that envelope what you’re going to get. You could get standing room; you could get a player’s box; or just about anything. But for $11, how much do you care? We showed up at 7 because our research indicated that 7am was the sweet spot. We could have showed up at 8:55, but then we would have been waiting on line longer. They opened three windows at the box office and we had our voucher by 9:02 am. We promptly then walked around the corner and bought tickets for the first ballpark tour of the day, starting at 9:30. This was one of our favorite tours so far. The tour guide was affable and knowledgeable; he was a fan, but hadn’t done the tours or worked at the ballpark so long that he was jaded. He was able to answer any question thrown at him and was exceedingly polite and respectful: it was always “Mr. 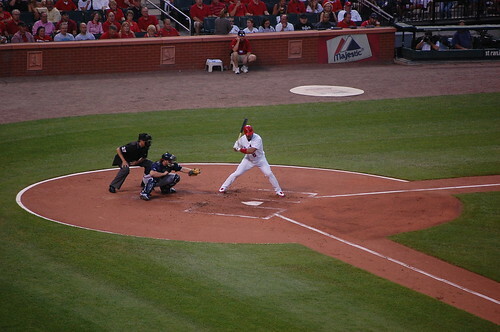 Stan Musial.” Not “Stan” or “Stan Musial”. Every Hall of Famer was “Mr.” There were two guides assigned to the tour, one bringing up the back, picking up stragglers and helping people who needed the elevators. 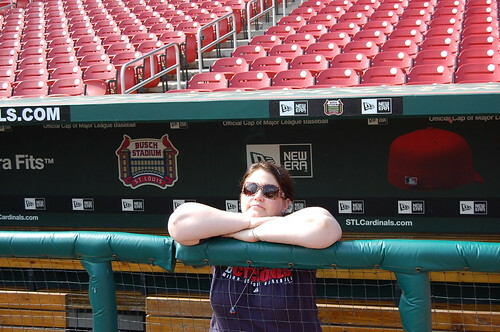 We realized during the tour that the reason the ballpark always looks like every single person is wearing Cardinals gear is 1) they are 2) there aren’t sixteen different official color schemes and 3) all the seats are red. The saying between Cardinals fans is apparently “I’ll meet you at Stan.” I liked that. One of the important pieces of information we got from people waiting in line for tickets was to get back to the stadium and on line at the centerfield gate (where the First Pitch tickets are handed out) by no later than 6:30. We got in line around 6:20 and were the first people there. We were the only non-Cardinal fans in the line. (And before you ask, no, we were not wearing anything that would identify us as Mets fans, aside from my companion’s Cyclones hat.) The advice we got when we were waiting in line earlier that morning was that you wanted as much of a time advantage as you could to get to your seat, since it always seemed like the seats were on the opposite side of the park from where you came in. This was 100% true in our case; we were given section 237, First Base Boxes, and although we were initially delighted, once we got there we realized that calling the seats “First Base Boxes” was a very charitable description indeed (Right Field Boxes might have been a better description). But, for $11, we weren’t going to complain. We were in the second row of the section, with a fine view of everything we wanted to see (except the Gateway Arch). Surprisingly, Busch does not have an open concourse plan, except in the outfield, where it’s a lot like Citizens Bank Park. The upper levels have various types of club seating in the infield, much like Shea will have. You can’t really do an entire circuit of the stadium and still see the game. The one disadvantage to the First Pitch scenario is that we didn’t have time to walk around the park during the game (we talk about doing stuff like that but then never do it, because we actually like watching the game). There was limited food on our level, but when we left and walked around on the field level, we realized that was where all the good food choices were (in a manner of speaking). 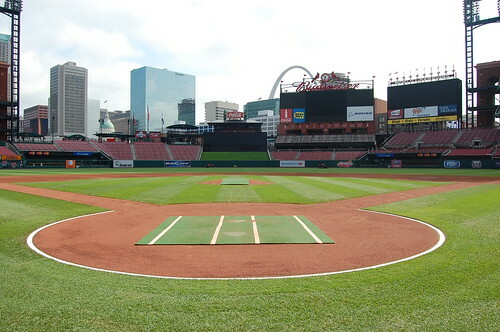 Some people have compared Busch to Citizens Bank Park, and aside from the prevalence of red everywhere and the plaza in the outfield, I didn’t see much of a comparison at all. CBP always feels like a ballpark in miniature. Busch felt like a world class stadium. We liked it a lot. 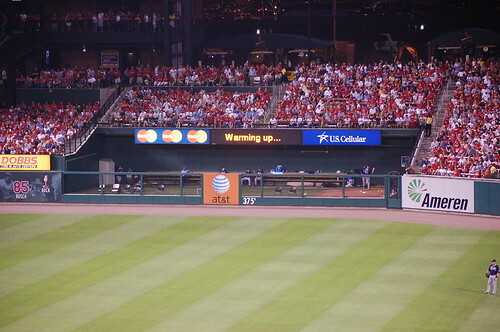 Bullpens were separated in left and right field with seats above and on either side. 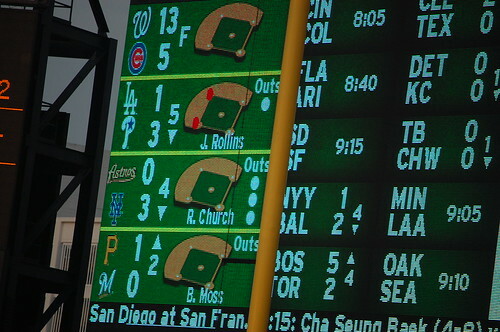 There was a light-up board above each one that would broadcast ‘Warming up…’ as a relief pitcher would get up to do just that. 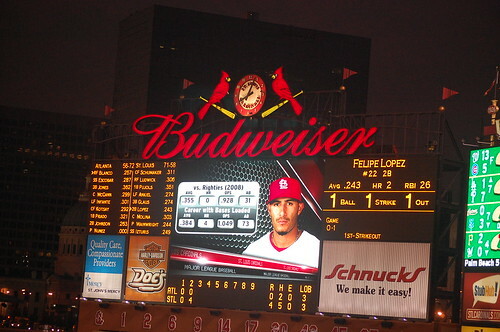 The out of town scoreboard – something very important to us that night – morphs into advertising between innings. We are not a fan of this. 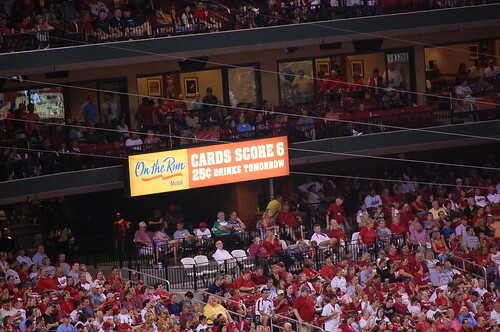 Otherwise, we liked the scoreboard quite a bit. I don’t have anything in my notes about music which means it wasn’t anything notable, either on the positive or negative side. 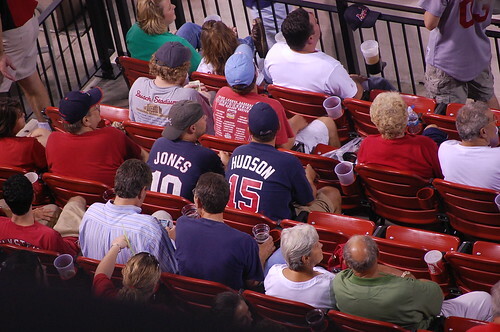 The 7th inning stretch wasn’t anything thrilling one way or the other. However, they did sing both “God Bless America” *and* the National Anthem before the game, and EVERYONE stopped. Notably, they stopped letting people into the stadium, since the ticket takers all stopped what they were doing. The lines, of course, continued to get long while this was happening. I am fine with, say, not letting helping people find their seats or stopping concessions. 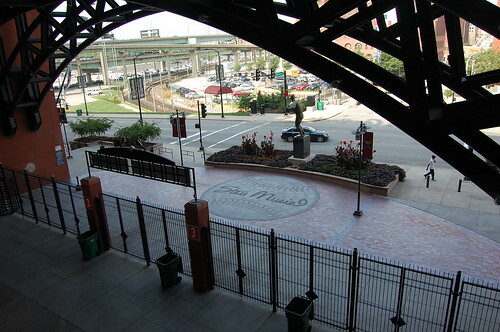 But stopping people from entering the ballpark just seems like an empty gesture masquerading as patriotism. I mean, I thought that kind of thing only happened in the Bronx. 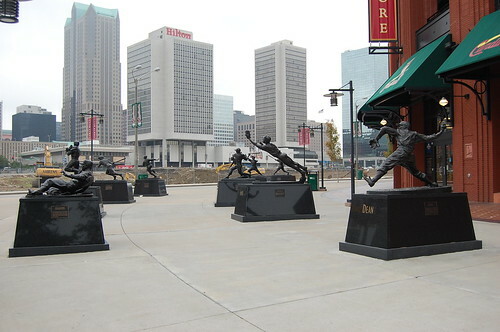 Busch is definitely trying to be a downtown ballpark, even though there isn’t much of a downtown around it. 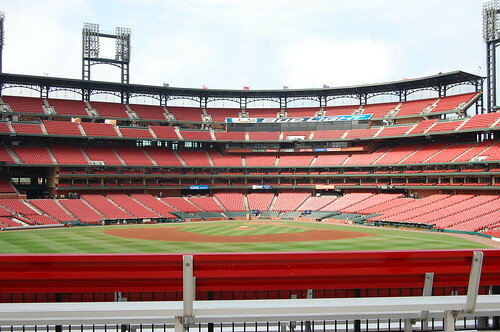 You can see the Gateway Arch from most of the seats, and public transportation is easily accessible – but parking is readily available and doesn’t cost an arm and a leg. 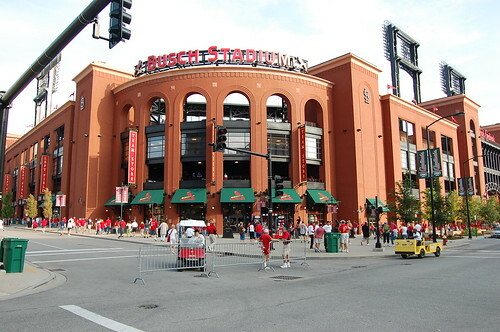 They close off the streets around Busch during games, which gives it a festive feeling. There are a couple of bars and restaurants within walking distance, but this isn’t a Wrigley or Fenway type area, and while there is a section of downtown with nightclubs and trendy restaurants, you’re going to struggle to find food after the game (as we did). There isn’t much to downtown St. Louis *at all* – it’s gotten a little nicer since we were last there (in 2004, when we were in town to see Pearl Jam on the Vote for Change tour), but it’s got a very long way to go. 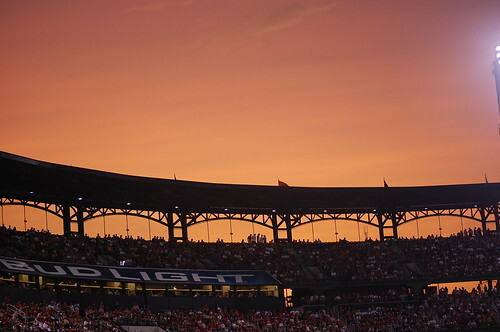 We Hotwired a hotel and ended up near the Convention Center and the football stadium, which was fine – it was two stops on the light rail or a 15 minute walk – but if I ever had to do it again, I’d spend the money to make sure I was right near the ballpark. If you did that, you could totally come in for a series without needing to rent a car, since light rail runs to and from the airport.